TA XBIEX, MALTA--(Marketwired - July 13, 2016) - All Slots Casino has released two great new online pokies games for summer. One is a deep-sea fishing expedition for all you fishermen and fisherwomen; the other is a heavy metal rock-n-roll sci-fi pokies extravaganza that will boggle your mind. Reel Spinner, of course, has a double meaning. You can spin the reels on the pokie machine and you can spin the reel on your fishing rod; either way, you are a reel spinner. The play on words is marvellously clever, and the Reel Spinner online pokies game itself is equally brilliant. It has 5 reels, 15 paylines, five different types of colourful fish to catch, and all sorts of fishing equipment. 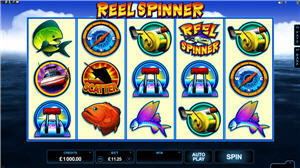 It has wild symbols and scatter symbols and it also has an exciting Free Spins feature in which you pick a boat to reveal the number of Free Spins and spin the reel -- yes, the reel on the fishing rod -- to reveal the multiplier. It's fantastic fishing fun. The Electric Diva online pokie machine has it all: The Electric Diva in her black costume and the Electric Diva in her red civvies, along with bats, scorpions, electric guitars, and armed alien invader spaceships. It has five reels and forty paylines. It has a mesmerizing electric-bass-and-guitar soundtrack. It has the Electric Diva Bonus Game in which you blast the armed alien invader spaceships with your ray guns to win up to 40 free spins and up to 8X multiplier on the payouts. It has scatters and wilds and big real money jackpots. Yes, Electric Diva at All Slots Casino has everything. All Slots Casino was established in 2001 and offers top value entertainment with its wide array of exciting casino games and a generous bonus program. Developed and powered by Microgaming, All Slots Casino is available in both Download and Instant-Play versions, and its mobile casino is compatible with nearly every device. All Slots Casino is accredited by eCOGRA and prides itself on fair play and fast pay-outs, as well as its dedication to responsible gaming by preventing under-age play and assisting members who develop gambling problems. For further information, visit: www.allslotscasino.com.